Currently unavailable but still loved and supported! NOTE: Would you like to know when Little Dog Poems is available? Please use the contact form and we'll keep you posted! From cold-nose wake-up to bedtime with a Little Dog-shaped lump under the covers, a day that a little girl spends with her Little Dog is recounted in thirty short, playful poems and enchanting watercolor illustrations. Little Dog protects the little girl from vacuum cleaners and beetles, chases cats, digs up flowers, and waits hopefully as kitchen preparations take place and as popcorn is eaten. The little girl, who loves Little Dog enough to "bake / birthday cookies with / liver powder," retrieves tennis balls, brings home a present from the pet store, and observes how little a wet Little Dog becomes at bath time. 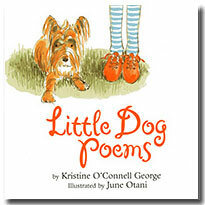 A perfect introduction to the pleasures of poetry, this beguiling volume belongs on every young dog lover's bookshelf. See what happens in the companion book—Little Dog and Duncan—when a BIG dog—a very big dog—arrives for a doggy sleepover. Little Dog is both delighted and miffed! Another warm-up was suggested to me by Francess Burch who teaches in Redlands, CA. Francess read Little Dog Poems to her students without showing them the illustrations. She then invited them to draw illustrations to match the poems they had just heard. I thought this was a wonderful way to demonstrate to students how the words of a poem creates images in our minds. I've also had fun using music for a "warm-up" to a reading, or to set the mood for a poetry writing workshop. A favorite is "Linus & Lucy" from George Winston's Linus and Lucy: The Music of Vince Guaraldi. 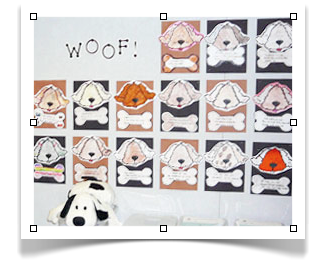 If you've used Little Dog Poems or Little Dog and Duncan in your classroom and have an idea or suggestion to share, let me know and I'll add it to this page. Well, that certainly wasn't a haiku! However, Myra was intrigued and gave me an assignment: write more "little dog" poems. I ended up with around fifty poems which my editor, Dinah Stevenson, finally narrowed down to the thirty poems in the book. Even though they are short, I wrote and re-wrote these poems many, many times. Dinah and I frequently exchanged what we called "kibbles and bits" — e-mails in which we debated punctuation, placement, and even one single word. I wanted each poem to capture the spirit of a individual, specific moments in a little dog's life — without any extra words. I also wanted to keep the poetry "open" so that young children could read it easily and relate the poems to their own family pets. 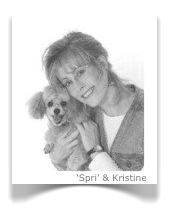 I had excellent "resource material" — our dog Spri (short for "Sprite") — and my memories of Pretzel, my ornery miniature dachshund. June Otani wove her fond memories of her own family dog, Jasper, a Cairn Terrier, into her art. Truly, this was book of both of our hearts. Sometimes, I find myself thinking: What about getting another dog? Perhaps a terrier like Jasper? "100 Titles for Reading and Sharing"